Tim Cook Coffee Auction Closes Tomorrow, Current High Bid at $605,000 - iPhone.MY - Daily News On Mac, iPhone, iPads, iPods and more! With one day to go before bidding closes, the CharityBuzz auction for coffee with Apple CEO Tim Cook is at $605,000. Bidding has slowed considerably since the first couple of days, with only one bid — the current winning mark of $605,000 — since April 26th. 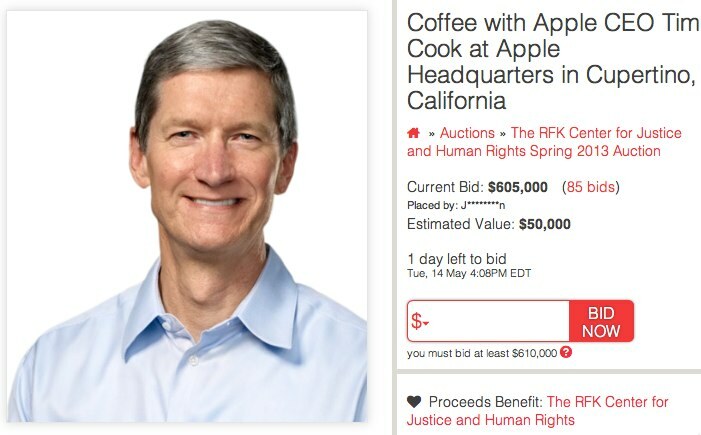 The current high bid for coffee with Tim Cook is worth twice as much as the total of the current high bids on all 118 other auctions supporting the RFK Center for Justice and Human Rights in the current campaign on CharityBuzz. The site running the auction was also forced to implement financial verification checks for bids on the Tim Cook listing after a bid was placed using a stolen credit card. The auction’s bidding quickly rose to $500,000 in the first two days with a number of bidders affiliated with third-party accessory makers looking for publicity or simply a business meeting with the Apple CEO. Bidding closes tomorrow, May 14, at 1:08 PM Pacific Time. Mac App Store to Launch As Early as December 13th?